Oswald Cobblepot, that fowl felon, has arrived! The Penguin appears as he does in Batman: The Animated Series. Limited edition bust stands about 6-inches tall on a themed base. Includes a hand-numbered box and certificate of authenticity. 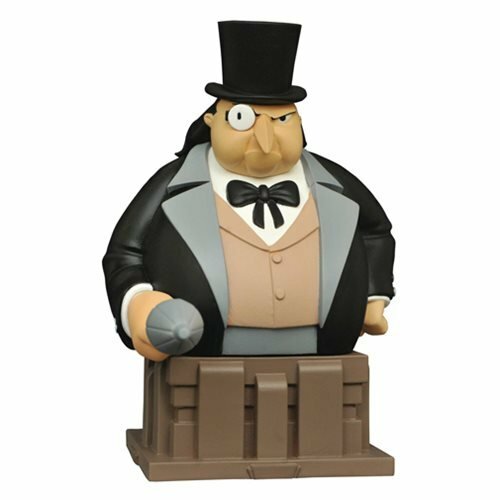 Oswald Cobblepot, that fowl felon, has arrived in the Batman: The Animated Series bust collection! The Penguin is captured in his classic animated appearance from the series. He measures just under 6-inches tall, perched on a pedestal base inspired by the show's art-deco architecture, holding his ever-present umbrella. The Batman: The Animated Series Penguin Bust is limited to 3,000 pieces and comes packaged in a full-color hand-numbered box with a hand-numbered certificate of authenticity. Ages 13 and up.